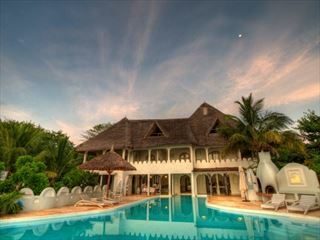 If you enjoy an unhurried lifestyle where days are spent unwinding on sugary sand beaches and eating fresh seafood, we’re certain you’ll relish a holiday spent at boutique Hemingways Watamu. 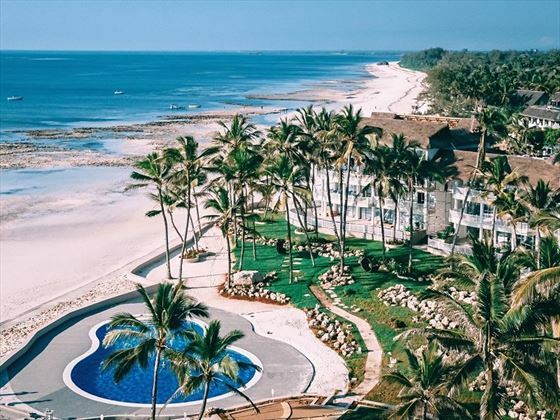 Perched along a dazzling beach within Watamu Marine National Park, this gorgeous retreat truly evokes a charming sense of Kenyan beachside luxury. Days here can be as active or as relaxed as you like. Embark on a sun-soaked fishing excursion or learn how to dive in the crystal-clear lagoons, or maybe you’d enjoy lounging by the pool before hopping on a sunset dhow cruise along Mida Creek – however you decide to spend it, you’ll be blessed within beautiful views and friendly service. We love the fresh, airy style of the rooms and apartments here. With large windows, scenic balconies and a mix of white and bold colours, there’s a lovely Swahili ambience to every accommodation. 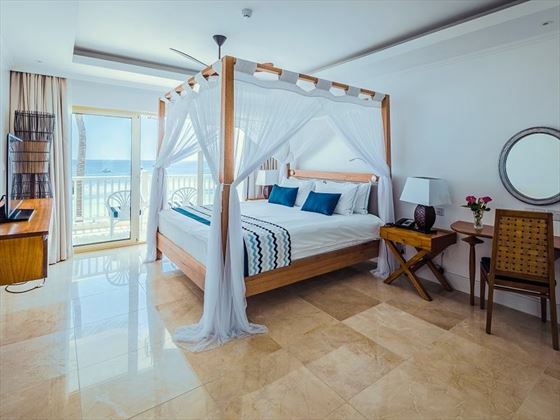 The intimate One Bedroom Ocean View Apartment is perfect for couples, whilst family getaways are best suited to the spacious Two or Four Bedroom Deluxe Ocean View Apartments. 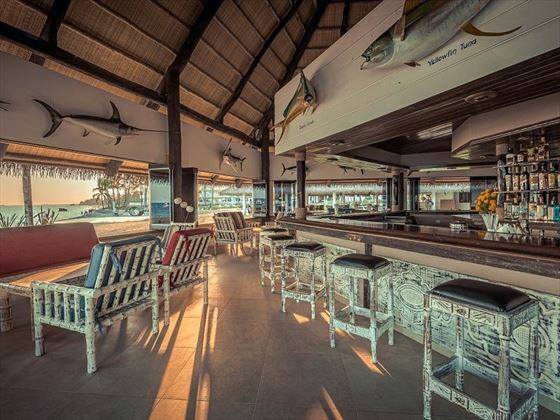 Just steps away from the beach, it’ll come as no surprise that the restaurant here focuses on delightfully fresh seafood plucked straight from the sea, cooked with authentic Kenyan flavours and locally grown ingredients. Sit in the sun and treat yourself to a flavourful gelato, or gather your loved ones together for a delicious sharing platter at lunchtime. Time spent at Hemingways Watamu is all about those little moments that make a stay extra special. 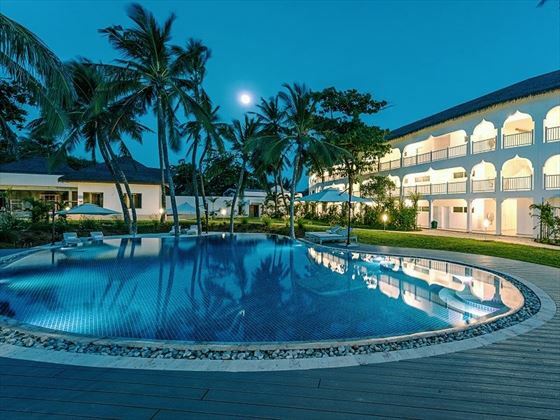 Nestled in the heart of the naturally stunning Watamu Marine National Park, this hotel is surrounded by pristine white sands and jaw-dropping turquoise waters, and evokes a sense of serenity and seclusion. 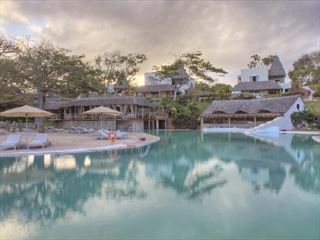 The retreat is close by to Watamu, a small fishing village that boasts a myriad of incredible marine life, including manta rays, sea turtles, and whale sharks. Ocean View Room – Located on the first floor of the North Wing, these spacious rooms have easy access to the beach. The bright and airy décor create a lovely beach vibe. Deluxe Ocean View Room – Found on the top floor of the North Wing, these rooms evoke a sense of laidback luxury with their wide open spaces, lovely balcony, and wide screen TV. One Bedroom Ocean View Apartment – Beautiful apartments boasting a separate bedroom, a spacious open-plan living, dining and kitchen area, and a huge open terrace. 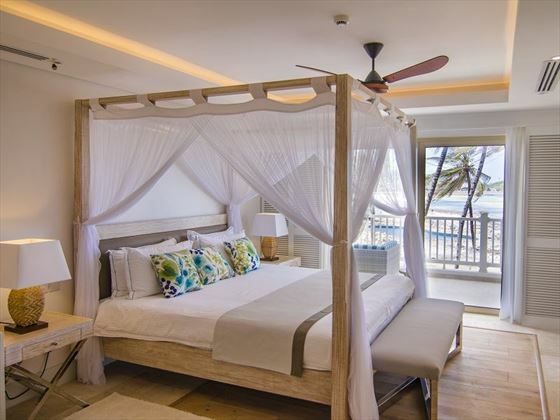 Two Bedroom Ocean View Apartment – With a master bedroom with an ensuite, and a second bedroom with two twin beds, these apartments are great for families. Featuring a living and dining room, and a kitchen. 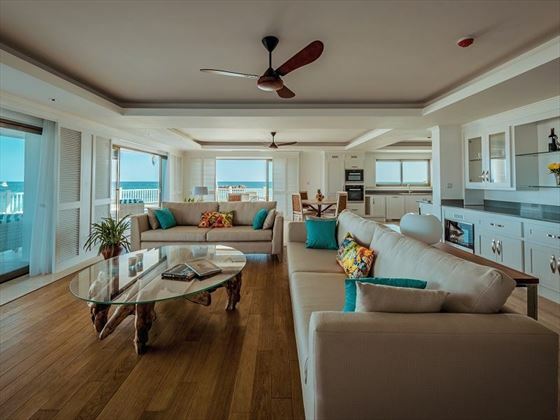 Two Bedroom Deluxe Ocean View Apartment – Larger than the apartments before, we love the natural light that floods through into the living and dining space. The apartments also feature a modern kitchen, a master bedroom with an ensuite, and a second bedroom with two large twin beds. 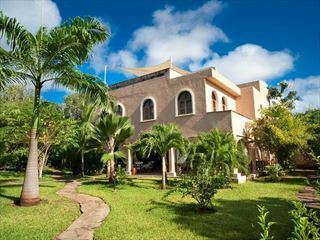 Four Bedroom Deluxe Ocean View Apartment – These penthouse-style apartments are truly luxurious. Featuring two floors – both with large furnished terraces – there are two large master bedrooms with ensuites, and two big twin bedrooms with adjoining bathrooms. The apartments also boast indoor and outdoor living and dining spaces, as well as a fully equipped modern kitchen. The hotel has a gorgeous al fresco restaurant, where the focus is bringing you fresh, simple food created with local ingredients. Wander along to Gede Coffee Gardens for a mid-morning coffee and gelato, or they do delicious wraps, sandwiches and sharing platters at lunchtime. 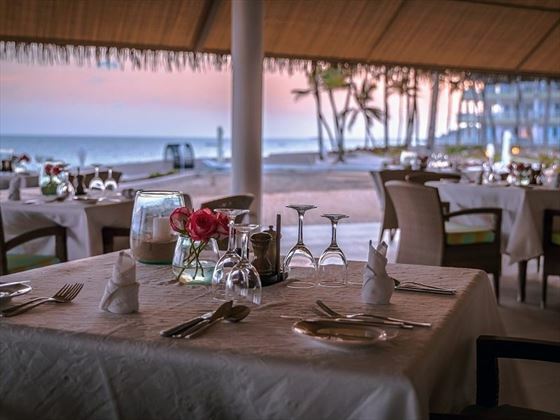 Sit in the sun and dine on healthy salads and grilled meats, and then in the evening treat yourself to seafood caught fresh from the ocean that day and cooked with authentic Swahili flavours. For an extra special occasion, you could even catch your own dinner. The iconic Hemingways Bar is nestled right on the beachfront, offering a large menu of delicious cocktails, wines and beers.